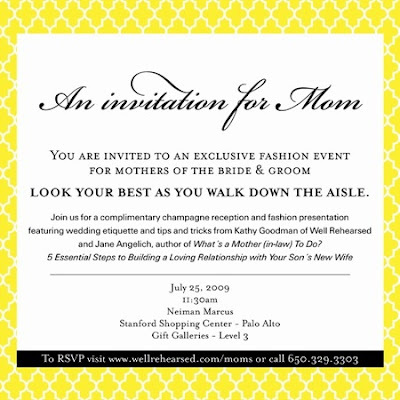 My good friend Kathy Goodman of Well Rehearsed is putting on an event especially for moms! Do you feel that shopping for mother of the bride or groom attire can be more complicated than finding the perfect wedding dress? Then this event is for you, your mother and future mother in law. Stop by the Neiman Marcus in Palo Alto for a morning of fashion, wedding tips and expert advice! !